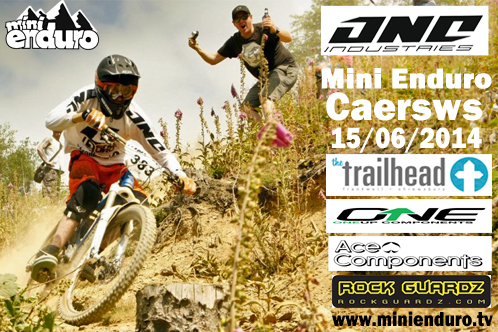 The next One Industries Mini Enduro will take place at Caersws Mid Wales. Race Day Sunday 15th June 2014. After last years race we got so much good feedback we are returning to Caersws to some great stages spread across the hill side that drops you into the super fast blast across the grassy fields into the finish arena. The race at Caersws is little different to normal loop out into the forest and back to finish area, the tracks all make their way back to finish area to make a more relaxed event with live times at the bottom of each stage. We will mixing up the tracks at Caersws to give you 4 stages on parts of some never used tracks at Caersws. The map for the stages will be released on Friday night before the race so it’s a level playing field for everyone come Sunday’s race day. The format is practice all morning and race in the afternoon over the 4 stages, there will be nice easy transitions times between stages which will return you back through the pits after each stage. The Mini Enduro’s will take place over one day and will be of a shorter distance to the Uk Gravity Enduro’s to allow riders to practice the 4 stages before the start of the race later in the day. Distance will vary but expect around 10 miles to complete the 4 stages and the route. With a morning practice lap and the race you will cover around 10 to 15 miles. The transitions will follow the marked route to keep everyone going in the right direction. Total stage times will be added together to produce the overall results for each category. New easier entry system click the link to enter. Some say there is not much disadvantage to racing on a hardtail to a full suspension bike so why do a category for them? We see this has ride what you have type of racing if you have an all mountain bike that’s great if you have hardtail XC bike or a do it all hardtail then this is way for you start racing on it and chance to stand on the podium in your category. This category is for the more experienced racers to have some fun racing and get some practice in for the Uk Gravity Enduro Series. For Example if you’re in the at least the top 10 of your category Junior, Senior, Master, Vets in the Uk Gravity Enduro Series you should race Pro-Am so you can test yourself against other quick riders and rider a different group of riders which will spice things up and hopefully make it more fun racing a Mini Enduro. Time Controls are used check riders in ready for the stage start time. a downhill bike but not recommended with the riding in-between transfer stages. Only one Bicycle can be used during an event, including any transition stages. Competitors must start and finish the competition on the same frame, fork and wheels. A helmet conforming to technical regulation 8.6.1 must be worn during all race and transition stages. Knee and elbow protectors are advisable. All Competitors must be self sufficient and prepared for a varying climate as well as any basic mechanical repairs. Consideration should be given to the nature of the course and the length of time the event may take to complete. This course is marked with signs and with some sections that are taped if a specific line should be taken on the stage. If a competitor leaves the trail/course, they must re-enter at the same point and must restore the tape as they found it. If a rider is spotted cutting a special stage course by a marshal they will be disqualified. You must have sign on and collected your number board by 11.00am to race. Saturday 14th June 2014– Forest open to ride. will be posted in Registration on Sunday Morning. We all have our own speed of racing some are fitter & faster then others which can lead to faster riders catching up slower riders on a stage. If a faster rider is behind you on a special stage, be polite and allow them to pass. If you are the faster rider, be patient and give lots of warning and clear directions as to what side you will pass. For example; shout left, if you intend to pass on the left hand side of the rider in front. If you over take a slower rider on the stage then you can continue in front of the slower rider for the start of the next stage. This will stop the faster rider always catching the same rider again in the next stage. At the start of each stage there will be a time control. You must reach the TC no later then your start time which you will you be advised of with your stage start times. In the interest of safety each stage has a cut off time when the stage is closed. Riders arriving after the stage has closed will not be allowed to start and must return to the finish area. We look forward to seeing you all in July. Trade stands or demo your range of bikes at the Mini Enduro please get in touch. e-mail chris@minienduro.tv for details. Is overnight camping available on the Saturday at Caersws ?